6 layers of Earth structure in a fun online geography learning game. "Earth Structure Puzzle" is a free online knowledge level game to sort the objects in correct Earth layers to learn the interior structure of the Earth. It include 17 objects, which may be observed, or are formed in a specific Earth layer. 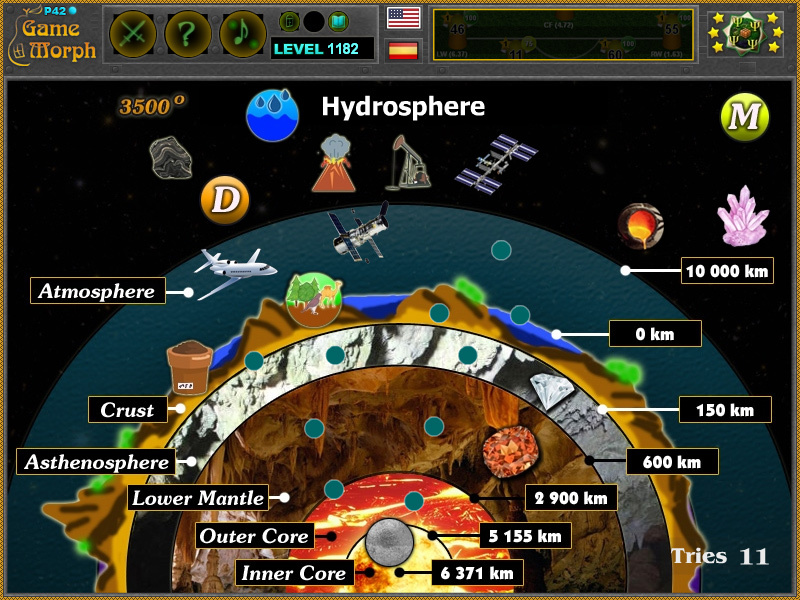 Free online game to explore, learn or test the knowledge of Earth's structure. Geography puzzle game, suitable for online lessons and interactive classes. Minute to win it game. Cumulative with the Earth Structure Test . How to play Earth Structure Puzzle. There are 17 movable pieces with different objects or layers, which may be observed, or appear in different layers of the Earh's structure. Drag and drop them at the approximate location of the correxponding layer. Sort all 17 objects to win the game. After that try to slove the Earth Structure Test . Know 5 layers of Earth interior structure and get +1 Knowledge Level. Class subject: Structure of Earth. The interior structure of the Earth is layered in spherical shells: an outer silicate solid crust, a highly viscous asthenosphere and mantle, a liquid outer core that is much less viscous than the mantle, and a solid inner core. Scientific understanding of the internal structure of the Earth is based on observations of topography and bathymetry, observations of rock in outcrop, samples brought to the surface from greater depths by volcanoes or volcanic activity, analysis of the seismic waves that pass through the Earth, measurements of the gravitational and magnetic fields of the Earth, and experiments with crystalline solids at pressures and temperatures characteristic of the Earth's deep interior. Which are the 6 basic layers of the Earth? Which is the deepest layer of humans dig? How many layers do Earh have?